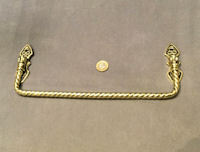 Original, quality late 19th century wall mounted tubular brass umbrella rail with two circular brass backplates, each with three countersunk screw holes for mounting. 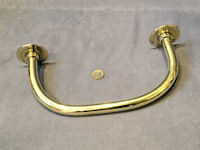 This super rail would also be ideal as a towel rail in the guest bathroom. 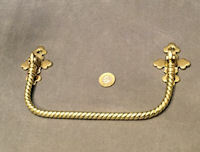 Polished and lacquered, although the lacquer may be removed at no extra cost and is complete and in good order. 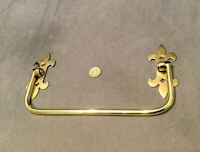 Backplates 2.5" diam. Total 13.5" widest and 6.25" front to back. Original, quality late 19th century superbly detailed cast iron umbrella stand in an aesthetic movement form with much rope twist detail. The reverse is embossed for the manufacturer "E & T Smith Sheffield", "No 42" and with a registration lozenge mark. All has been cleaned and lacquered and is complete and in good and working order. One old small repair to the central upright. 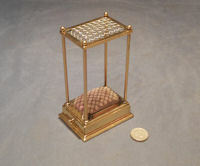 31" tall, 16.5" widest and 8.5" front to back on base. 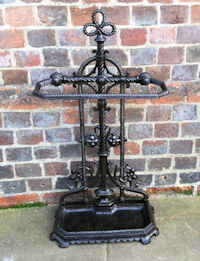 Original, quality late 19th century small cast iron umbrella stand with a lift out cast iron drip tray, a 'D' shaped top rail and embossed designs in the aesthetic movement manner of sunflowers and others. All has been cleaned and lacquered and is complete and in good and working order. 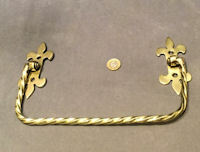 26" tall x 12" wide at back and 7.25" front to back. 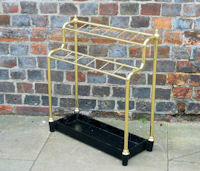 Original, quality 1920's rectangular shaped brass umbrella stand with a six section brass top with brass finials, mounted on four brass pillars on the original cast iron base and with a lift out tin drip tray. 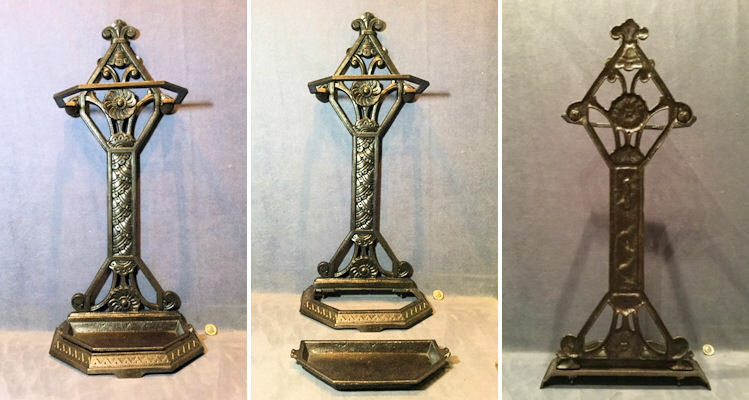 The cast iron base and tray have been cleaned and repainted black, and the brass has been polished and lacquered, although the lacquer may be removed at no extra cost. All is complete and in good and working order. 23" tall x 12" x 8" base. 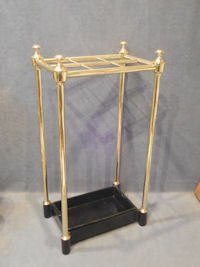 Original, quality 1920's brass umbrella stand with a rectangular shaped cast iron base, four brass stems and a "waterfall" twelve section brass top mount with two turned finials, a most unusual design. 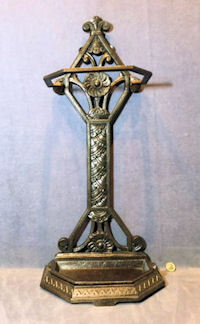 The iron base has been cleaned and repainted gloss black and the brass polished and lacquered, although the lacquer may be removed at no extra cost. All is complete and in good and working order. 24" tall and 21.5" wide x 9" front to back.